If there was ever such thing as a country ran by Grinches, North Korea would be that country. Why? Well, according to the BBC, North Korea has warned neighboring South Korea of "unexpected consequences" if South Korea decides to light up Christmas trees near their border. 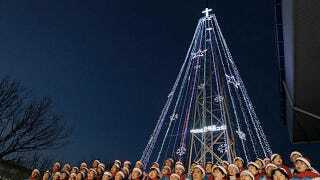 North Korea's biggest beef with the Christmas lights is that they feel that South Korea is using those lights to "spread the Christian message" to North Korean citizens. Paranoid, much? Yes! The "unexpected consequences" would have to do with some sort of "psychological warfare" on South Korea. What does that even mean? I'm thinking NK has no idea what that means but as long as it's provocative (shout out: Will Ferrell), it's completely fine with them.